War is coextensive with civilization. Or, to add an important qualification, war has been coextensive with civilization so far. Another way to express this is to say that warfare is an invariant property of civilization as we know always known it. Where there is civilization, there will be war, and where there is war (except for the Hobbesian war of all against all) there is a civilization making that war possible. War is not the only invariant property of civilization. I can think of at least two other civilizational invariants, namely hierarchy and settlement. Civilizations as we have known them to date vary according to the particular kind of militancy, the particular kind of social hierarchy, and the particular kind of settlement practised, yet the possession of some kind of militancy, some kind of hierarchy, and some kind of settlement has proved invariant in the history of civilization. I have addressed this question previously in separate posts that did not make clear the systematic relationship that holds among invariant properties of civilizations. For example, in Civilization and War as Social Technologies I emphasized that war and civilization are locked in a coevolutionary spiral. It could with equal justification be said that civilization and hierarchy are locked in a coevolutionary spiral, or that civilization and settlement are locked in a coevolutionary spiral. In Invariant Social Structures I observed that the one social structure that remained constant in the transition from agrarian civilization to industrialized civilization was, “a very small political elite in positions of real power and the vast majority of people without any access to power at all.” It could with equal justification be said that war and settlement also remained constant in the transition from agrarian to industrialized civilization. 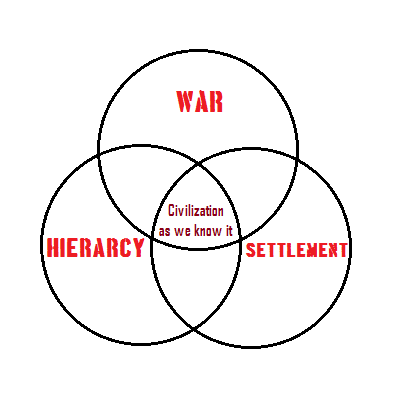 In Civilizations Settled and Unsettled and in Settled Life, Settled Thought I tried to show how settlement is intrinsic to civilization and is central to the thought of civilized peoples. It could be said with equal justification that militarism and hierarchy have been constitutive of the thought of civilized peoples. Taking together the civilizational invariants of militarism, hierarchy, and settlement, we arrive at eight possible permutations, one of which is civilization as we know it today, while the others may have some vague historical precedents — the most radically distinct social institution of nomadic egalitarian pacifism bears a striking resemblance to what has been called the Paleolithic Golden Age — but which may also be understood as templates for post-civilizational successor institutions. It is an interesting corollary the entanglement of civilizational invariants that, not only is each engaged in coevolution with civilization, but each is also engaged in coevolution with the others, so that there is a coevolutionary spiral of war and settlement, of war and hierarchy, and of hierarchy and settlement. There has been a scientific revolution in historiography that has unfolded for the last several decades, and, in so far as history studies civilizations, the next step is to think scientifically about civilization. Thinking scientifically about civilization is obviously going to result in difference according to how one conceives science and how one conceives civilization. While my approach to this is rather different than mainstream historiography, I have written about the possibility of The Future Science of Civilizations, and the above investigation in the invariants of civilization may be taken as representative of how I would approach such a science of civilization (as well as of post-civilizational successor institutions). 1. Read Azar Gat’s War in Human Civilization. It is the best book I have read on the subject. I might even go far as to say that it is the best multi-discplinary work written in the last 15 years. You would like it. a) What counts as war? b) What counts as settlement? If we can count the incessant clash between hunter gatherer clans than war predates hierarchy or settlement. They are the most war like people in the world – if it counts. The Norse were agriculturalists who liked to make long range attacks on their neighbors. I think the Eskimoes fit your definition better, and they were pretty agressive as well. Interesting that you should mention the Norse, as I had a conversation about this once when I made a similar point in a presentation. I maintained then, and I still maintain now, that while the Vikings kept their farms secreted up fjords and on Iceland, the center of their civilization was the voyaging and not in the settlement. This isn’t a very persuasive formulation, but another way to put it is that all the higher culture of Viking civilization is associated with ships and their voyages — the ships themselves in their design and construction and decoration, and the portable appliances that were made to be carried in them. Moreover, Viking poetry and sagas were centrally concerned with voyages of exploration and discovery, raiding and plunder, trade and commerce. Natives peoples of the polar regions are also a good illustration of nomadic civilizations, as you point out. It is interesting to compare, however, the peoples of the north pole and the peoples of the south pole. In the far north, which also hosted the Vikings and the Sami, the native peoples arrived at a fairly “wealthy” modus vivendi, which does not seem to have been the case at the south pole (cf. Darwin’s remarks on the peoples of Tierra del Fuego, in his The Voyage of the Beagle). Perhaps the great freezing mass of Antarctica was too much for any people to thrive in the vicinity. You are absolutely right to raise these questions. While I was writing the post I was thinking about all the qualifications and conditions that need to be made. I have Azar Gat’s book on Fascist and Liberal Visions of War, which is apparently the last volume of a trilogy of studies; I don’t yet have War and Human Civilization but hope to get myself a copy. There have been several studies that have drawn attention to war in paleolithic times, most notably War Before Civilization: The Myth of the Peaceful Savage. These studies have tended to focus on the fact that while before civilization there were no large, organized armed conflicts, the number of people killed in violent incidents is proportionally higher than the number of people killed from war in “civilized” societies. So I guess I am using war to mean “large, organized armed conflicts.” If you take away that qualification, my argument loses steam. So, yes, nomadic hunter-gatherer societies were very violent, but was the violence warlike? Similar considerations hold for settlements. I think of settlements as large, organized settlements that are not temporary camps or seasonal camps for transhumance. A definitive formulation would be able to capture these details while still maintaining the point I was trying to make. I think the point is worth retaining, but I can easily imagine someone rejecting it entirely.